I was thinking about sunrises and sets the other day. Understanding when the Sun will rise and how long the day will be is the basis of calendar systems, fundamental to agriculture, and the first step of studying astronomy (sort of). I remember cherishing the long summer days as a child, when the Sun seemed to set almost past my bedtime. Working hours for many people are still limited to available daylight. We wake and sleep with the Sun. In the spring I'm excited because the days are getting longer, and I feel like I have been gifted a little more time every evening to finish the day's work. In the fall I scramble, racing the sunset, and sometimes that stirs creativity too. Of course this curve looks slightly different for every location, but the features are generic. Encoded is so much wonderful subtlety about astronomy, geography, geometry, ... and even politics (daylight savings!) 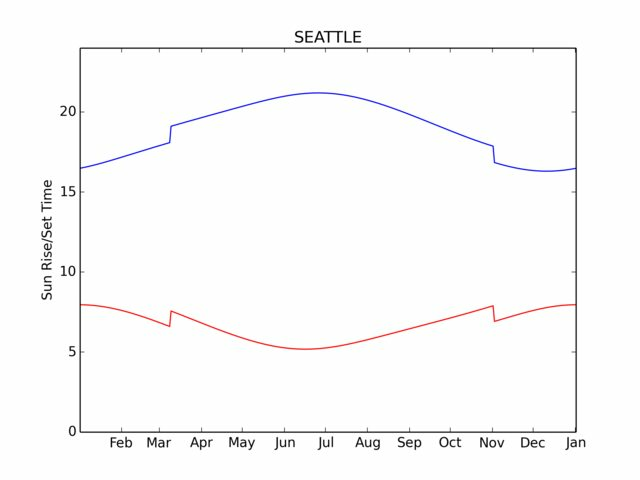 What is most striking to me: how much the length of daylight changes over the course of a year! Don't think about it as "when does the Sun rise/set" every day. Instead, think of "how much more/less time in the Sun do I get today?" The answer to this too depends on your location. Here is a rough model based on PyEphem's data. 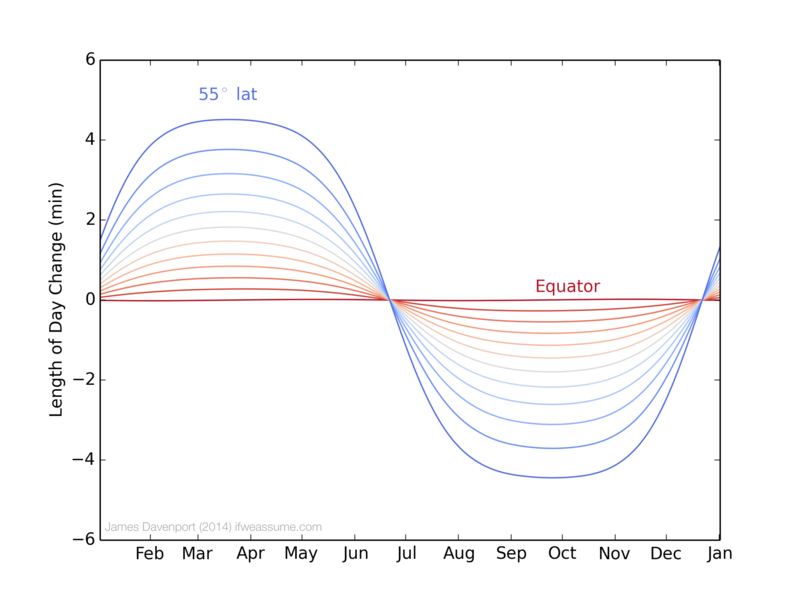 I limited the graph to latitudes from 0 through 55. If you get in to the mid 60deg latitudes then you have problems with the Sun not setting/rising during certain parts of the year. I also started finding some strange (small) discontinuities in the solution from PyEphem at high latitudes. Of course this second graph is essentially the derivative of the first. In words: we're computing a slope, the change in daylight hours per day. Simple calculus with an intuitive meaning. Now, go enjoy the Sun! Fascinating. Like the DST on the first graph. Might add some interest to put lines in for the equinoxes and solstices. Well done.